Free-range Waitrose Corn Fed Chickens make an excellent choice for a roast. 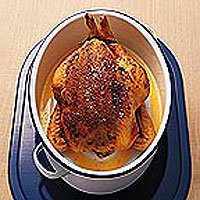 In this recipe the chicken is given added flavour with a coating of gently spiced butter prior to roasting. The finished chicken is perfect served with baked potatoes and squash. Mix together the butter, spices and tomatoes. Use your fingers to loosen the skin above the breast bone of the chicken and push as much spiced butter as possible under the skin. Spread the remainder over the surface. Season well with salt. Place in a roasting tin and cover with kitchen foil. Cook in a preheated oven 190ºC, gas mark 5 for an hour. Uncover and baste well with the juices. As an alternative to baked potatoes try cooking roast potatoes, carrots and parsnips around the chicken. You will find that they take on the delicious spicy flavour of the chicken. For garlic and herb-coated chicken, blend together 85g softened Yeo Valley Slightly Salted Organic Butter with 2 cloves crushed garlic and a finely chopped pack of Waitrose Herbs for Pasta. Season well and use as for the recipe above. Serve with crisp-skinned baked potatoes, pan-fried squash and beans. This recipe was first published in November 1999.